I’ve always been a morning person. I’d be up with the sun, get in my run, shower, shop, and measure my success by the amount of productivity I accomplished all before noon. My second daughter really gave me a run for my money (no running pun intended!) and totally tested my ‘morning person’ persona. After about 8 months of virtually no uninterrupted sleep, we got her to sleep through the night. I am so thankful for a solid night’s sleep, but my cute little ‘alarm clock’ as I affectionately refer to her as, consistently wakes me abruptly at 5:30 each morning–greatly improved from the 4am wake up calls I used to get. What I’m getting at is I’ve never valued sleep so much in my life until this experience. I can’t bring myself to get up before her in the morning–it would have to be 4:30 if I wanted to get a workout in (I just can’t). So lately, after her morning milk and my coffee, I’ve started implementing a morning fitness routine to set the tone for my day. Nothing crazy. Just little tweaks that make a big difference. This doesn’t necessarily need to be your whole workout for the day–that can wait till your regularly scheduled time. What I like to do is make some time (like, 5 minutes) to just set the tone for the day. Since I am trying to make it a total automatic habit, I am doing the same routine every morning. What works for me right now is a mini-fit vinyasa of mountain pose, standing forward bend into plank. 5 push-ups into downward dog. 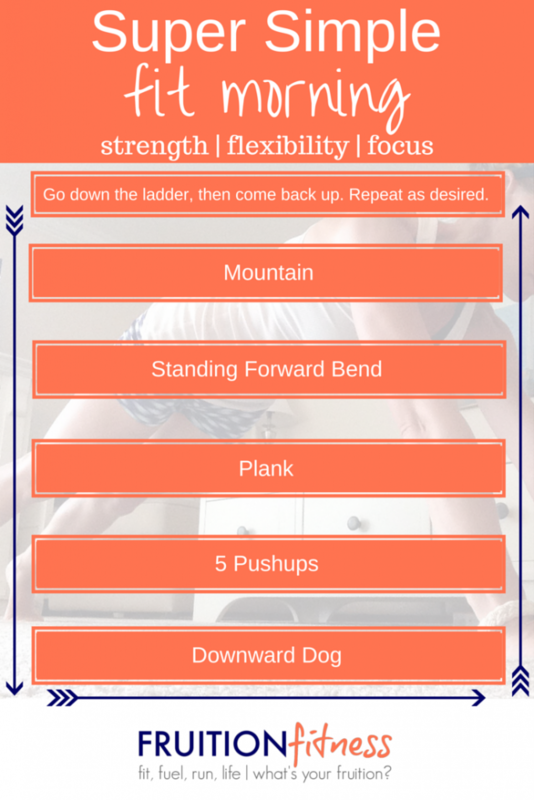 5 more pushups and downward dog, then back up to forward bend and mountain. I feel physically rejuvenated, mentally focused, and ready to tackle my day. One of my fitness non-negotiables is coffee. Never giving it up. Not doing it. So what I’m loving right now is following my cup of coffee with a nice tall glass of iced Nuun. The days have been hot and humid lately and I feel great hydrating before I head into the day. *This is a change from my old habit of following up my morning cup of coffee with another cup of coffee. This habit was not working. I ended up not even beginning to hydrate until noon and was experiencing terrible headaches–yikes! I might still have a second cup later on, but at that point I’ve already had a glass of Nuun and additional glasses of water. Some people swear by tea in the AM, others by lemon water, so just find something that works for you! Something I worked on during the school year (full time teacher here), was eating before I left the house in the morning. Waking up at 5:30 and having nothing but coffee until 8 is not a healthy habit. So now I make a conscious effort to start fueling about an hour after waking up. My fuel correlates with if I will be going for a run that morning or not, but either way, I know I’m in for a busy day. Mornings can be rough for multiple reasons and being prepared makes it so much easier to make healthy decisions. I’ve made a good habit of always having protein packed muffins or energy bites (dark chocolate of course!) on hand, and these have been a life-saver on busy mornings. I literally leave the container open on the counter, and my husband and myself pop one every so often as we are bustling around trying to get out the door. I wish I could say I practice this one, but I so want to–that’s why I’m including it on the list! Waking up 20 minutes earlier than normal to free up some extra time can make a huge difference. The handful of times I’ve woken up before the kids has given me the opportunity to mentally and physically prepare myself for the day ahead. I’m able to attend to all of the above points in a focused and peaceful manner. Set small attainable goals, like drinking one glass of water or doing 5 push-ups. Choosing goals that have a minimal impact on your current schedule will give you an increased chance of success. Only add in more after a habit is solidly established. Studies show that it may take up to 66 days to commit an action to automaticity (unlike the 21 days that is a common myth), so regardless, any habit you are trying to attain should be something that will fit in long-term with your lifestyle. 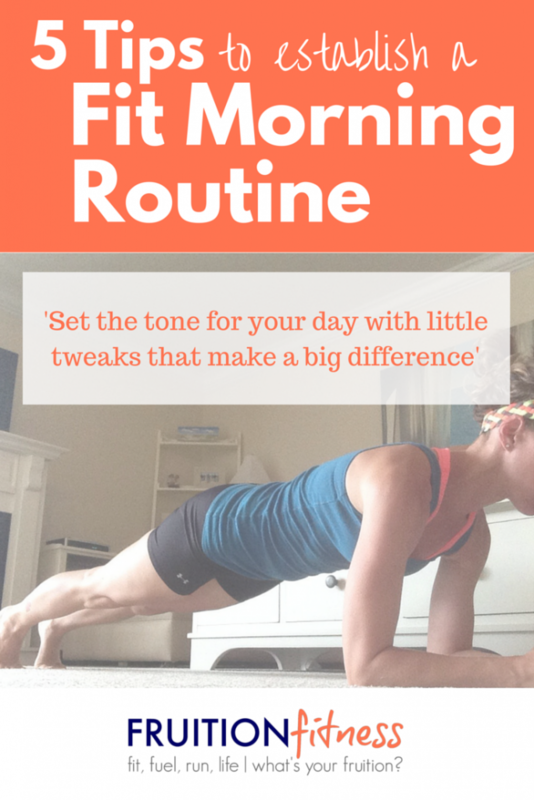 Do you have a fit morning routine? Welcome to our Wild Workout Wednesday link up! Each week I link up with Annmarie from The Fit Foodie Mama, Jen from Pretty Little Grub, and Nicole at Fitful Focus to bring you workout ideas, motivation, inspiration and recipes to try. Join us for a wild workout each week by reading along or grab the button and link up if you have a fitness or healthy living post to share! I love these tips…and love how you encourage small steps each day…that’s really what health is all about!!! Totally! An all or nothing approach can be dangerous…every little change counts! I’m a morning person, but I normally reserve my workouts for after work since I work from 7:30-4. Lately I’ve been feeling worn out after I get home from work so I think I may try to fit in 2 morning workouts a week. Thanks for providing these tips! Early mornings are hard, but after work is tough too! It’s all about finding that balance! Me too with the coffee! I’m a long time morning person. I struggle with PM workouts. They’re just not the same. In a perfect world I’d get up and do my regular workout in the morning, but since that’s not always happening I need a little bit to get me through the day. These tips have been working for me! Great tips! I am a morning person too and am so much more with it early in the day. I need to get back in the habit of a glass of water in the morning. Thanks! When I was just drinking coffee all morning it was crazy! I totally felt the negative effects! So I am not a morning person but more of a mid morning person. Same tips def apply thanks for the link up! I love these suggestions. It really is small little changes that can make all the difference. Thanks Jen! I can totally attest to the fact that they are making a difference in the quality of my day! I used to be so good about popping right outta bed and getting in my workout before work, but lately, I’ve been sleeping in and heading to the gym after work. I much prefer going in the morning, but for some reason it’s been tough lately! Life ebbs and flows! Just gotta go with it! The JUST GET UP. It took a little while, but now that I have a routine that I have established, it is just the only way I can start my day! I really do need to take my own advice on that one too! Thanks! It’s super simple, but a great morning energizer! OMG with the 5:30 am wakeups… let me just tell you something — my daughter is 3 and still wakes up in the middle of the night for NO REASON!!! What is that?!?! I value sleep like none other. Great tips! Im always up earlier than I need to be, not always to workout…but just because I love having some quiet time to myself before the start of the day. I love this morning workout has a little yoga its perfect! So nice to start the day with some quiet time…and yoga! I am not a morning person… so mornings are hard. This past week I’ve been working on getting out of bed when the alarm goes off instead of hitting snooze (and then setting a timer).